William Walter Whittington was born in Battersea, London, in the winter of 1896 and baptised at St Phillip's, Battersea on 25 November 1896. He was the younger son of railway porter, later goods guard Sydney Whittington (1873-1948) and Louisa née Manning (b1868) of 81 Robertson Street, Wandsworth. Sydney and Louisa's eldest son was Charles Stanley (b1896) and by the time of the 1911 census the family had moved to Yeovil and were living in Percy Road. 14-year old William gave his occupation as a printer's proof reader, he worked at the Western Gazette offices. The family later moved to 63 Alexandra Road. The 2/4th Battalion was formed as a second line Territorial battalion of the Somerset Light Infantry - a duplicate of 4th Battalion. It was formed in September 1914 as part of the 45th (2nd Wessex) Division. The battalion, including William, served in India and the Andaman Islands from December 1914 until September 1917. The battalion then relocated to Egypt as part of the 75th Division in September 1917. They moved to France in January 1918 and were converted to a divisional pioneer battalion within 34th Division in June 1918. They were almost immediately in action at the Battle of the Soissons. The Battle of Soissons (also known as the Battle of the Soissonnais) was a battle during waged from 18 to 22 July 1918, between the French (with American and British assistance) and German armies. Ferdinand Foch, the Allied Supreme Commander, launched the offensive on 18 July; 24 French divisions and 2 British and 2 U.S. divisions under French command, supported by approximately 478 tanks, sought to eliminate the salient that was aimed at Paris. The Allies suffered 107,000 casualties (95,000 French and 12,000 American), while the Germans suffered 168,000 casualties. The battle ended with the French recapturing most of the ground lost to the German Spring Offensive in May 1918. Adolf Hitler, the future Führer of Nazi Germany, earned and was awarded the Iron Cross First Class at Soissons on 4 August 1918. It is thought that William was wounded in this battle, being shot in the abdomen. He was hospitalised but died from his wounds on 31 July 1918. He was 22 years old. The Western Gazette, in its edition of 9 August 1918, reported "Mr S Whittington, 63 Alexandra Road, yesterday (Thursday) received an official telegram announcing that his son, Private W Whittington, of the Somerset Light Infantry, had died in hospital in France from gunshot wound in the abdomen. Deceased, who was 22 years of age, was previous to joining the Army employed in the general printing department of the “Western Gazette.” He was a member of the local Volunteer Force, and when war broke out was mobilised, and proceeded with his Regiment to India. Afterwards he saw service in Palestine, and from there was sent to France in June last. Deceased is the fourth member of the general printing department staff to make the supreme sacrifice in the sacred cause of freedom." 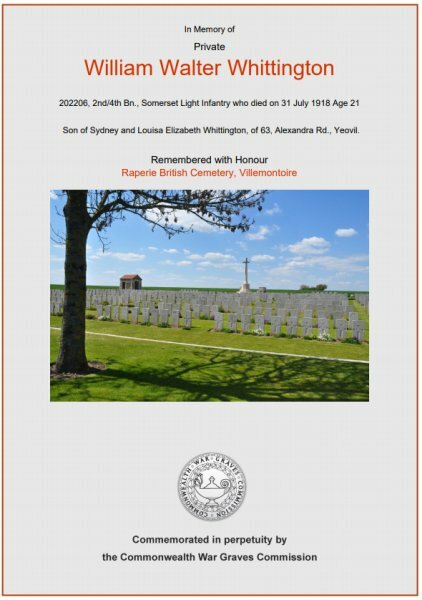 William Whittington was interred in Raperie British Cemetery, Villemontoire, Aisne, France, Grave IVA.D.7, and his name is recorded on the War Memorial in the Borough. The Commonwealth War Graves Commission certificate in memory of William Whittington. 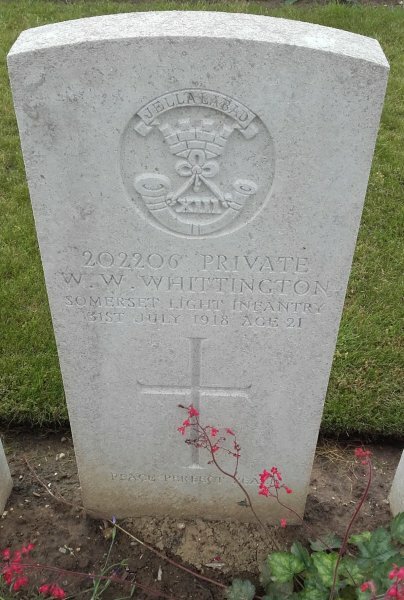 William Whittington's Commonwealth War Graves Commission headstone.